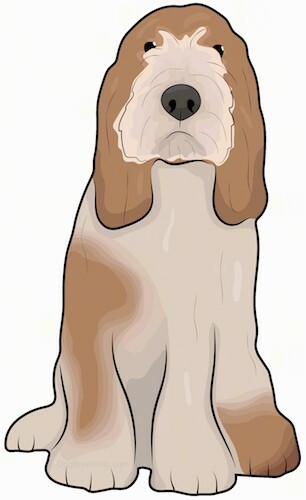 This dog is medium size, has a medium length coat with longer, coarser hair on its ears, legs, and around its muzzle which makes it appear as though it has a beard, mustache and long eyebrows. They have a longer neck, longer tail, and a medium length snout. Their medium size is balanced through their even posture and deep chest that tapers up at their hind legs. This dog is traditionally meant to hunt rabbits and their longer back and proportioned legs help them run long distances at a fast pace. They usually have a base coat of white fur along with markings of either tan, brown, or fawn usually on their ears and around their eyes and spots on their tail or back. The Grand Basset Griffon Vendeen is known to be fast and courageous when on a hunt. They are alert most times of the day and often make noises such as barking or baying whether it be because they are bored, on a hunt, or restless. They are an intelligent, independent dog breed with a stubborn side. It is best to socialize the Grand Basset Griffon Vendeen while they are a puppy in order to have a balanced dog later on. They are known to be wonderful with people, other dogs, and children although be wary with smaller animals because these dogs have a high hunting instinct. 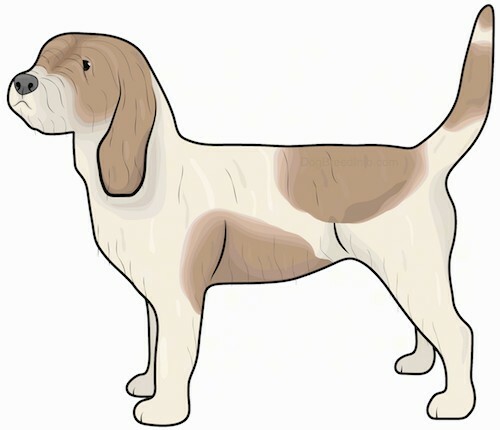 The Grand Basset Griffon Vendeen is very energetic and loves to play, go on walks, and run around outside. Be watchful for signs of epilepsy and Leishmaniasis as these seem to be bigger health concerns with this breed. Because this breed tends to be more active, it is important to also be mindful of elbow or hip dysplasia. For optimum health, your dog should have regular vet checkups. While these dogs are energetic and of medium size, they do not do well in apartments or small living situations. They thrive with a larger living space where they have more room to wander and a medium to large backyard where they can play, run around, and explore. The Grand Basset Griffon Vendeen is very energetic and intelligent. With these two combinations, it is important to exercise both mentally and physically. They require daily walks and a space to run, play, and explore. Training them and doing tricks often is an important part of exercising their minds. These dogs are independent and tend to be mischievous if they do not have the proper exercise and they are also quite stubborn at times. Because this dog has a medium to long coat, it is important to brush them frequently, usually weekly, and trim their coats when needed. Because their hair is more coarse, many prefer using a hound mitt which can easily remove loose or dead hairs when shedding. It is common to trim their coats once a year in order for this dog to be more comfortable. Bathe them when necessary. In the 1700’s, the Grand Basset Griffon Vendeen originated in Vendee, France. They were known to hunt small prey such as wild boar and were especially known for hunting rabbits. Although this breed is quite old, the breed did not have a standard until the 19th century which means the Grand Basset Griffon Vendeen may have appeared slightly different in the early stages. While this breed is more popular in Europe, the Grand Basset Griffon Vendeen was first imported to the United States by Arlene and Mike Dickinson in 1990 from Holland. In the following 4 years, a total of four Grand Basset Griffon Vendeens were imported to the United States and from there, the breed slowly repopulated, producing the lineage for most the dogs we find in the United States. In 2004, the Grand Basset Griffon Vendeen was noticed by the American Kennel Club.